Lexus dealers regularly score high in customer satisfaction and quality of experience, outstripping Toyota's own dealerships, and as an ongoing part of vehicle ownership, that might be worth a premium to some. The 2010 Lexus LX 570 won't turn heads like a Range Rover or an Escalade, but it is a high-tech and worthy choice. 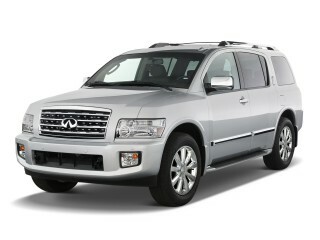 TheCarConnection.com's editors drove the 2010 Lexus LX 570 to bring you this concise overview in the Bottom Line. TheCarConnection.com also distilled the best information from the best reviews around the web to give a conclusive look at the new LX 570, even when opinions differ. The 2010 Lexus LX 570 is the third year of the new design first released in 2008. With exterior styling cues that'll let observers know it's a Lexus without hitting them over the head with its size, the LX 570's exterior design strikes an organic balance. Inside, excellent materials complement a luxurious yet functional layout, with controls well at hand. Sharing its core underpinnings with the Toyota Land Cruiser, the LX 570 has body-on-frame construction for durability and off-road performance, plus a 381-horsepower 5.7-liter V-8 engine that does the job on the highway and off. Passing and acceleration are a snap, but the nearly 6,000-pound weight is never far out of mind when maneuvering or braking. Visibility, while good forward, can be difficult to the sides or rear as with many large SUVs, particularly on city streets. A six-speed automatic transmission and Torsen limited-slip differential system deliver the power to the ground, helping the big Lexus tow up to 8,500 pounds. Despite the six-speed gearbox, the LX 570 returns a disappointingly low 12 mpg city. Getting in and out of such a big vehicle can be a challenge for smaller adults and children, but Lexus has an available active height control system that lowers the vehicle about 2 inches to ease ingress and egress. It also pays attention to the speed, raising the vehicle at low speeds to aid ground clearance and lowering it again at high speeds to help reduce aerodynamic drag. A Crawl Control setting in the off-road electronics equipment aids in negotiating tricky passages. Inside, the 2010 LX 570 has three rows of seating. While it shares a basic layout with the Toyota Land Cruiser, the LX 570 is more opulent and ornate. Wood trim, matte-metallic surfaces, leather, and high-grade plastics abound. There are a few shortcomings, however: While the front seats are spacious and comfortable, the third-row seating is too small for full-size adults, and it doesn't stow flat in the floor. "Loaded" is an apt descriptor for the average LX 570, and there are even more optional upgrades if you choose. Standard equipment highlights include four-zone climate control, power sliding second-row split seating, voice-activated navigation system with Bluetooth, sound system, XM Satellite Radio, and new for this year, Enform and Safety Connect, Lexus' new in-house telematics and emergency roadside services. 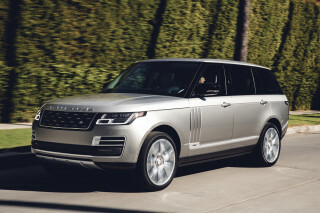 If that's not enough, optional extras include a rear-seat entertainment system, radar-adaptive cruise control, and a 19-speaker Mark Levinson audio system. African Bubinga wood trim, heated and ventilated seats, and custom wheels are also available. Safety is no place to scrimp, and Lexus doesn't with the LX 570, equipping stability control, ABS with all-terrain mode, front and second-row side airbags, side impact airbags for the second and third rows, and front knee airbags all as standard. 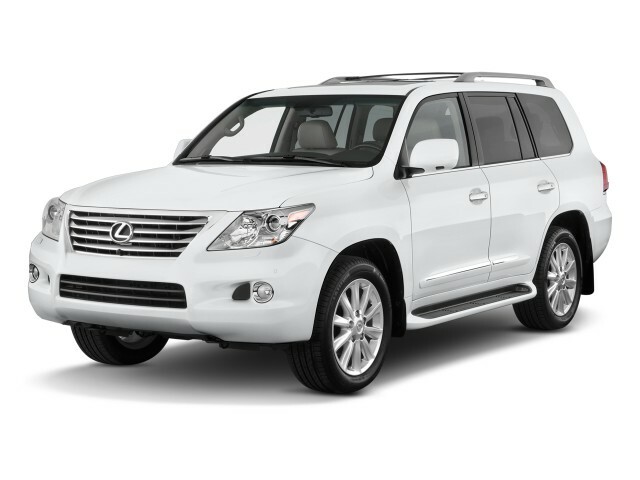 Luxurious and spacious, the 2010 Lexus LX 570 doesn't offer much excitement in terms of design. Kelley Blue Book explains the 2010 LX 570's in terms of the Lexus L-finesse design language, which offers a "more muscular appearance than the LX 470," meaning a "wider stance and more subtle design lines." 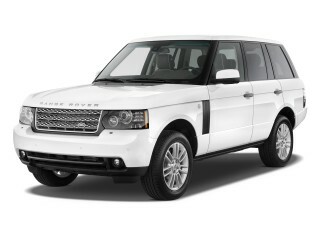 Cars.com says the 2010 LX 570 "resists attempts to make it truly distinctive," pinning the fault on "its body-on-frame construction," and add that something about the design of the tail lights "recalls Lincolns." Motor Trend argues the Lexus is essentially a "Land Cruiser in fancy dress." Edmunds takes its own road, calling the LX 570's interior "richly appointed," and making special note of the leather quality and available wood trim upgrades. Cars.com finds the interior uninspiring, having "broken no new ground," and ConsumerGuide agrees, adding that the interior is "upscale Toyota" rather than "true elite class." The 2010 Lexus LX 570 is a strong, capable vehicle but sometimes there's no escaping its sheer size and mass. Sharing its core underpinnings with the Toyota Land Cruiser, the LX 570 has body-on-frame construction for durability and off-road performance, plus a 381-horsepower 5.7-liter V-8 engine that does the job on the highway and off. Passing and acceleration is a snap, but the nearly 6,000-pound weight is never far out of mind when maneuvering or braking. Visibility, while good forward, can be difficult to the sides or rear as with many large SUVs, particularly on city streets. Cars.com points out that the the 2010 Lexus LX 570 is in fact "named after its 5.7-liter V-8 engine"-a worthy source for a name, as Automobile notes, "the big SUV has plenty of brute force." A six-speed automatic transmission and Torsen limited-slip differential system deliver the power to the ground, helping the big Lexus tow up to 8,500 pounds. Despite the six-speed gearbox, the LX 570 returns what Automobile calls an "abysmal" 12 mpg city and 18 mpg highway, even though, as ConsumerGuide points out, "Lexus recommends premium-grade gas" for the big truck. 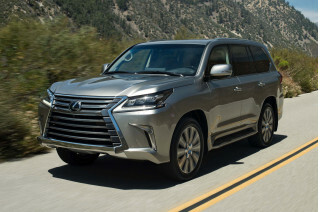 ConsumerGuide praises the Lexus LX 570's "smooth, responsive transmission," but Automobile finds the "driveline clunks" when taking off from a stop. 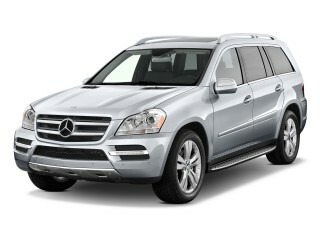 Cars.com points out that the six-speed gearbox boosts "towing capacity for a total of 8,500 pounds." Handling isn't a forte for the LX 570, says Automobile, because the "truck suspensions pitches and heaves constantly." ConsumerGuide agrees, noting that the "self-adjusting shock absorbers do little to enhance ride quality." Cars.com is the contrasting voice, pointing out the "air springs and adaptive shock absorbers." For high-clearance capability without the attendant leg-hiking entry, Lexus offers active height control to lower the 2010 LX 570 by up to two inches. It can also raise it at slower speeds to aid ground clearance, and lower it at higher speeds to reduce aerodynamic drag. Crawl Control helps in low-speed maneuvers over boulder-strewn paths or scree-strewn hillsides. Edmunds finds the 2010 Lexus LX 570's driving experience "a bit bland," but says it's only because of its "superb capabilities" taking away the fun. Stopping is a key requirement, especially when towing large loads, and ConsumerGuide says the LX 570 has "ample stopping control with progressive, well-weighted pedal action." Despite the brake praise, they do note that "the steering is too light for our tastes but is quick and has good feedback." 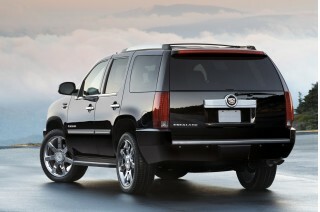 Despite its size, the 2010 Lexus LX 570 isn't the most space-efficient, but does rank high in comfort. Inside, the 2010 LX 570 has three rows of seating. 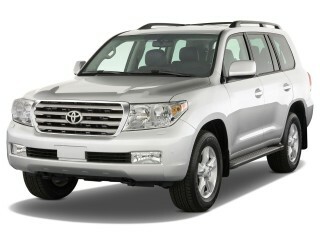 While it shares a basic layout with the Toyota Land Cruiser, the LX 570 is more opulent and ornate. Wood trim, matte-metallic surfaces, leather, and high-grade plastics abound. There are a few shortcomings, however: While the front seats are spacious and comfortable, the third-row seating is too small for full-size adults and it doesn't stow flat in the floor. Kelley Blue Book calls the LX 570's interior "comfortable" and finds "best-in-class second- and third- row legroom," plus ample headroom in all three rows. ConsumerGuide finds that while the second and third rows are well-padded, they aren't long enough in the thigh. Edmunds also considers the back row tight, saying "the third row still has a knees-up seating position that's suitable only for kids." Storage and cargo room are good, though Edmunds does complain that the third row "isn't totally removable," a fact that puts the LX 570 behind other premium large SUVs in total space. ConsumerGuide likes the in-cabin storage, especially the "bi-level dashboard glove box," and "large map pockets on doors and seatbacks." Quietude is abundant, says ConsumerGuide, living up to "Lexus's library-quiet reputation." Nevertheless, there is some coarse-surface tire thrum, and the big V-8 can make itself heard, though wind noise is low. MotherProof isn't completely sold on the LX 570, arguing that while it's a "very well-appointed truck...it's a truck nonetheless." ConsumerGuide finds the materials quality "high" and the detailing of the interior's build "thorough." A wide range of safety features and the comfort of sheer bulk make the LX 570 a safe bet even without official ratings. Even aside from all of that safety gear, however, there's still the LX 570's mammoth size. As Popular Mechanics quips, if the LX 570 "ever did hit anything with it at high speed, it would probably bounce off, since it's such a big, strong tank of an SUV." While that might not be the reality of the situation, it's certainly a common perception. Though the styling doesn't merit much comment in aesthetic terms, it does get in the way a bit, says ConsumerGuide, which notes that the Lexus LX 570's "high stance" and "rear-roof styling" impede visibility, though they note that the large mirrors, front and rear obstacle sensors, and rearview camera offset the loss. 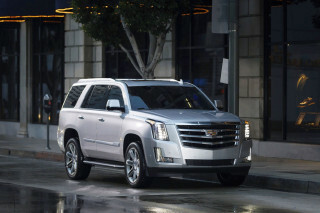 As with any large, tall SUV, rearward and side visibility can be difficult. Carried forward from last year's first application of the feature, the LX 570 has head restraints in addition to its flotilla of airbags, reports Cars.com, helping boost occupant safety even further. The 2010 Lexus LX 570 has almost everything an SUV driver could need, plus a world-class stereo system. "Loaded" is an apt descriptor for the average LX 570, and there are even more optional upgrades if you choose. Standard equipment highlights include four-zone climate control, power sliding second-row split seating, voice-activated navigation system with Bluetooth, a sound system, XM Satellite Radio, and new for this year, Enform and Safety Connect, Lexus' new in-house telematics and emergency roadside services. Edmunds says the 2010 Lexus LX 570 comes in "one base trim level," but that's just where things start. They continue to note that "gadget junkies" have a smorgasbord of choice, including optional features like a rear-seat entertainment system, radar-adaptive cruise control, and a 19-speaker Mark Levinson audio system. African Bubinga wood trim, heated and ventilated seats, and custom wheels are also available. The addition of the new Lexus Enform and Safety Connect features this year should help ameliorate the problems ConsumerGuide finds with the navigation system, though the fundamental issues-a lack of hard controls for functions like climate and audio-are likely to remain. Techno-geeks aside, Motor Trend points out that "[r]egular commuters and vacationers haven't been overlooked in the innovations," either. From features like a 180-degree camera that can see each way at a blind intersection to power-assist middle-row seats, there's a lot to love in the everyday-useful feature department with the 2010 LX 570.